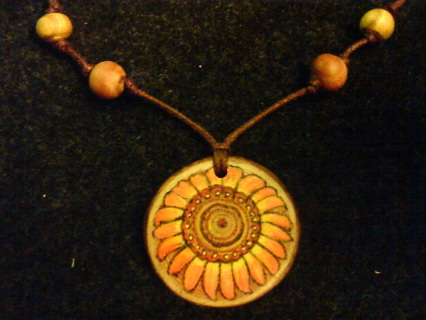 This unique necklace has been made from four different types of wood; Larch, Cotinus, Apple and Bamboo, all of which have grown here at the farm. The main central bead is made from Larch, Larix decidua. Larch has long played an inportant role in European folklore being said to protect against enchantment. 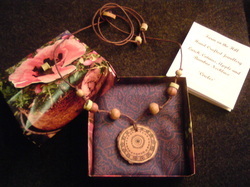 Wearing and burning larch is though to protect against evil spirits and the evil eye. 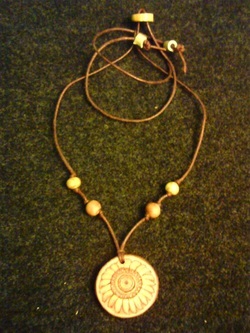 the beads are threaded on to a waxed cotton cord. The necklace is fully adjustable and can be worn at any length due to the slide button fastener.